Chunks of brown sugar run short because of cuts in output. May 7, Kokutoya, Naha. One of the main factories, Tarama, which is owned by Miyako Sugar Manufacturing, also reduced its production significantly to 1946 tons from the previous level of between 3500 and 3700 tons. 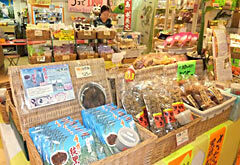 According to a spokesperson for the company, the average price of chunks of brown sugar has risen by 30 yen compared to that of the previous season, which was 230 to 235 yen for 30 kilograms. JA Okinawa, which operates five factories in Okinawa, also had its price go up 10 yen from the average, with the wholesale price becoming 230 yen.